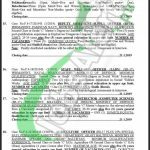 Get Patrol Officer Jobs 2019 | National Highway and Motorway Police Jobs 2019 NHMP Application Form Download | www.fpsc.gov.pk at this page of our site. Motorway Police Jobs 2019 are announced today through FPSC-Federal Public Service Commission for the Pakistani Nationals according to which 496 Vacancies of Uniformed & Non-Uniformed cadres are announced on Regional/Provincial, Women and Disable Quotas. Jobs in Motorway Police to apply are ( Patrol Officer, Accounts Officer, Computer Programmer, Accountant, Computer Operator). In FPSC Advertisement 01-2019 new announcement which is compulsory to focus is about FPSC Custom Officer Jobs 2019 which is ready to be recruit by the well educated individuals. A National Highway and Motorway Police invites application from both Male & Female belong to Punjab, Sindh Rural, Sindh Urban, KPK, Balochistan, Gilgit-Baltistan/FATA and Azad Kashmir. Motorway Police has also set the quota for Women and Minorities so that eligible candidates under these quotas can also apply. All interested candidates wanted to apply suggested to read the eligibility criteria mentioned in the following image and also after this paragraph. National Highways & Motorway Police abbreviated as NH&MP, is a police force in Pakistan formed on November 26, 1997, which is responsible for enforcement of traffic and safety laws, security and recovery on Pakistan’s National Highways and Motorway network. It has huge staff performing duties to maintain the motorway traffic. Motorway Police is a federal government department and jobs announced under it are government sector jobs. Today Latest National Highways & Motorway Police Jobs 2019 are announced which can be examined from this page. Candidates willing to apply should have Graduation qualification. Age applicant should be between 18 to 25 years. Relaxation in upper age will be granted as per Government Rules. Height for Male should be 5' and 8" with Chest measurement 33"-35". Heigh for Female should be 5' and 4". Applicants should possess Masters/Bachelors in the relevant discipline as per the demand of vacancies. Age should be between 20 to 28 years for the relevant post. For Complete list of Vacant Positions under FPSC Advertisement 01-2019 Please Examine the following image posted below. Motorway Police Jobs the last date for submission of application is January 21, 2019.